Everyone is invited to a free kick-off event with drinks and bites at Republic Square Park for Hello Lamp Post. 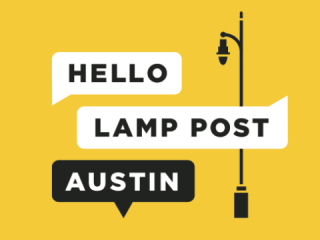 Hello Lamp Post is a citywide platform for play that allows people to talk to our city's infrastructure and share stories using the text messages. From February 12 until April 27, anyone can text the official Hello Lamp Post phone number and "wake up" lamp posts, moontowers, mail boxes, hydrants and even buildings to discover what these objects have to say. For more information about this Austin Art in Public Places project, visit the Hello Lamp Post website.